In the 10 years 18 Wheels of Christmas has been up and running we have seen a lot of support, generosity in donations and many of the heartfelt thank you from complete strangers for what we do but nothing compares to our favourite 2 ladies. Vyetta and Bev have constantly supported and promoted 18 Wheels of Christmas all of these 10 Years by inviting us into their business and accepting donations from their customers and friends. It needs to be mentioned as well Vyetta and Bev brave the cold (or even when it is above zero) right along with us. They have a unique way of obtaining donations and letting people know what we are all about. This year was no exception once again they invited us to set up in front of the Sobey’s in Douglasglen Square and once again the generous spirit of this Community came shining through. We collected 2 large boxes of donated food, $515.00 in food vouchers and $150.00 in cash. The cash donations go towards the purchase of baby food which is often overlooked. This was all collected in 2 hours. We can not thank Vyetta and Bev enough. On December 1 we will be at Lake Bonavista Promenade from 9:30 am – 1:00 pm Vyetta and Bev will be right there with us. 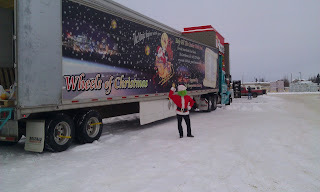 Well 18 Wheels traveled a little closer to the North Pole Saturday November 24th and visited The Energetic City, Fort St. John BC! Thanks to the generosity of the folks in Ft. St. John BC and especially our hosts at Home Hardware, our first collection day here was a success! Once again, we partnered with N.E.A.T. While they were in the store doing their Christmas Light Exchange, we were outside collecting donations and handing out coupons for the Home Hardware Store for every donation! It was a bit frigid out there but thanks to an endless supply of Tim Horton's coffee, we made it through the day. Chris, Karen and Brandon made the trip up from Dawson Creek and spent the day at The Home Hardware Store in Fort St. John BC. The day was not without it's difficulties however, we started our day off by getting stuck in some deep snow. Luckily Alec from the Ft. St. John Terminal showed up with a tow rope and gave us a little tug and got us rolling again. 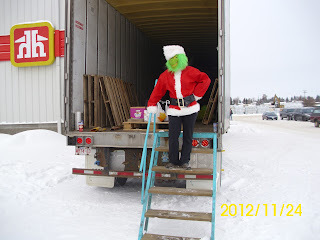 There was another tense moment when The Grinch showed up, threatening to deprive us of our hard earned Food Donations! However, after we explained to the Grinch that all the food we collected was staying in the community and going over to The Local Food Bank, it melted her little icicle heart and she began to help promote our cause! 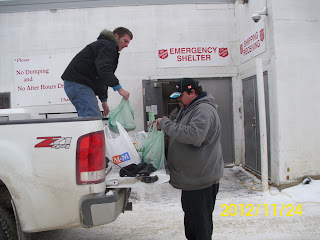 After we were done, we transferred all of the donations over to the pick up truck to run up to the Food Bank. It was a bit tight in the alley way and we decided that though it would be cool to deliver with the 18 Wheels Trailer, we might be stuck there until Spring came along! Thank you once again to Dzengo and Karen from N.E.A.T., (The Northern Environmental Action Team) for inviting us to be a partner with them in their annual event. I really want to extend my appreciation to my girlfriend, Karen and also to Brandon Jensen from Dawson Creek for giving up yet another Saturday to help out with this worthwhile cause. Your willingness to give so freely of your time shows a true representation of your characters and is a reflection upon you and the community in which you live. Well, we are getting the trailer polished up and ready to make the trek back down south for some exciting 18 Wheels events down in Edmonton and Calgary. Good Luck guys and we can't wait for next year to make it even bigger and better! Jeff Mayo, an Edmonton Line Driver and his family took a snapshot out of the movie, National Lampoon's Christmas Vacation! They decorated their home with literally thousands of lights which no doubt have attracted much attention in their neighborhood! In addition to the incredible light display which I'm sure took many hours to design and put up, Jeff and his family added the piece da resistance dead centre of the display. A collection box for 18 Wheel Of Christmas! 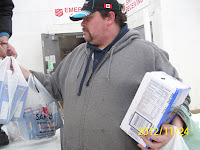 Jeff says his goal is to fill a body job for the 18 Wheels Of Christmas Food Bank drive in the Edmonton area! Way to go Jeff, we salute you and your family for undertaking this! It is the contributions of people like Jeff and his family that make this such a terrific event and cause to be involved in. How about the rest of you out there?m Let's get a box in front of every house! 18 Wheels of Christmas is busy busy busy we were back for the 4th year to Okotoks and the celebration they put on every year to mark the Christmas Season. Holiday Light Up kicked the season off on November 16th. This community really knows how to do it right. The main street is closed to everything except foot traffic. For the whole length of the main street there are fire pits on every street corner. Food vendors, hayrides and cartoon characters up and down the street. The big guy in red is always there greeting all the wee ones and handing out candy canes. Right in the middle of all the celebration is 18 Wheels of Christmas, the stereo blaring carols and our volunteers chatting with the families, petting dogs and most of all collecting cash and food donations for the Okotoks Food Bank. 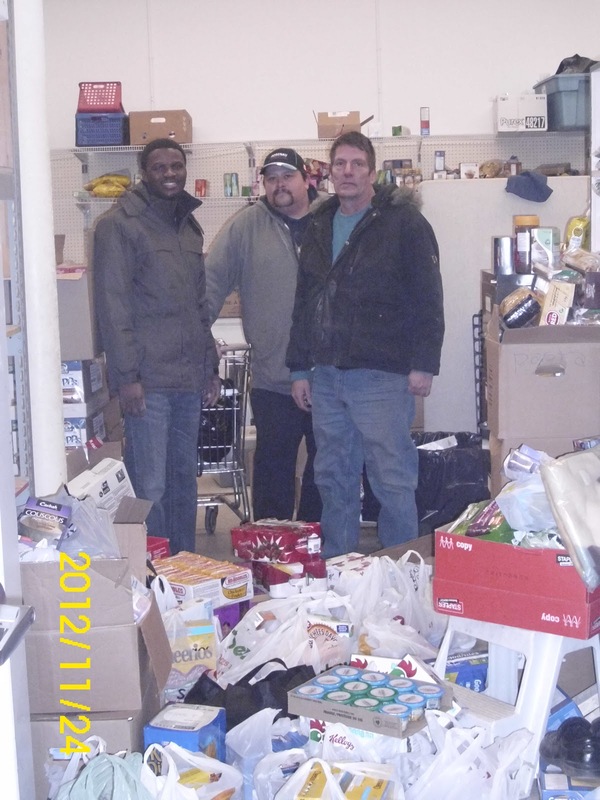 Karen Wilke of the Food Bank had some food bank volunteers on hand this year to help and boy did we need it. The donations started almost as soon as we finished setting up and continued this way until the fire works ended a fabulous evening. 18 Wheels was able to turn over to Karen Wilke and the Okotoks Food Bank $2766.50 in cash donations plus $600.00 in prepackaged food hampers as well as at least the same amount in dollar value of donated food from the fine folks of Okotoks. A huge thank you to Karen Wilkes for the advertising and your volunteers, Mark Doherty of Okotoks Public Works for the awesome parking spot last but not least Janet and Kent for their unwavering support and enthusiasm. November 24th you will find 18 Wheels of Christmas at the Douglas Glen Square in front of the Sobey’s then December 1 we will be at Lake Bonavista Promenade. These 2 venues have supported 18 Wheels for TEN years and we look forward to the invite from Vyetta and Bev every time. 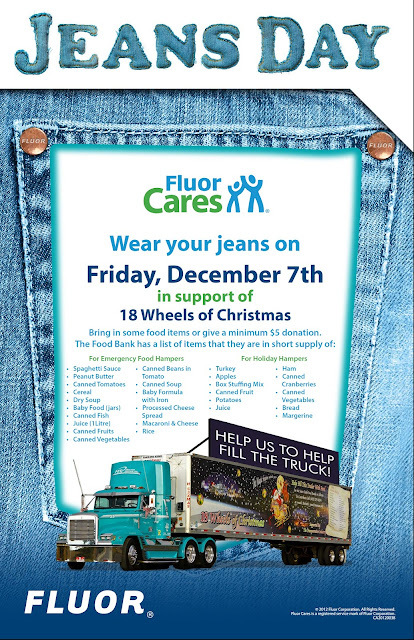 December 7th we will be a Fluor for their annual Food for Jeans Day. For the first time, the 18 Wheels Of Christmas trailer made an appearance in the City Of Dawson Creek BC! On Saturday, November 17th, 2012, we partnered up with NEAT (Northern Environmental Action Team) and CJDC for an exciting day at the Canada Safeway store in Dawson Creek. This is an annual event put on by CJDC and we were honoured and privileged to be invited to partner up with them. Despite frigid temperatures, the generous folks in Dawson Creek donated 1500 lbs of food for our local Salvation Army Food Bank. CJDC was on site all day doing radio promotions while our local Rosenau staff braved the frigid temperatures and filled the trailer. On Monday November 19th, we brought the food over to the Food Bank and helped fill many empty shelves and created a few smiles. I would sincerely like to thank our Rosenau staff who donated their time and helped out on collection day. Brandon Jensen, David Pelle, Bruce Sydnam, Molly Watson, Harold Modahl, Aron and Tracy Threinen. I would also like to thank the terrific folks at N.E.A.T. and Greg Evans and all the people over at CJDC. It was fun and we are looking forward to building it even bigger and better for next year! 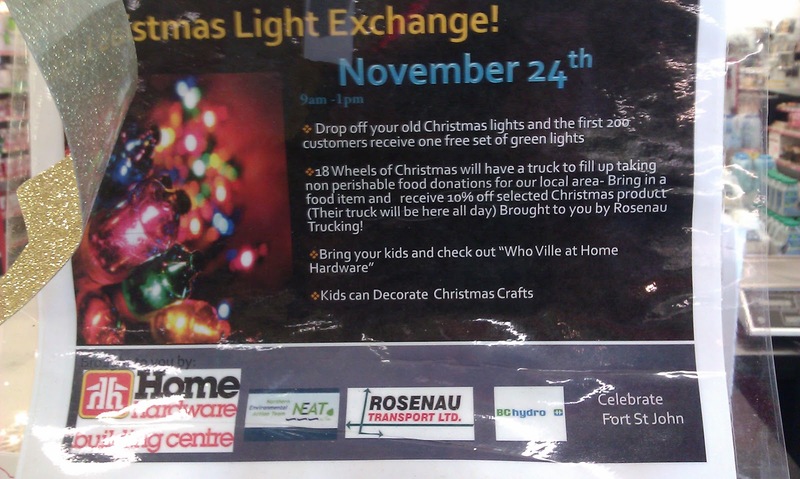 We are off to Ft. St. John for Saturday November 24th, 2012 for another first, collecting at the Home Hardware store. We will update you as soon as that event wraps up. Then the trailer will be making it's way down to Edmonton and Calgary for some exciting events down there! As we enter our 10th year of 18 Wheels Of Christmas, we are excited to see how much this worthwhile project has grown, and the difference that it makes in so many lives! Ten years ago, when we started, we had one trailer and one day of collections in the City Of Calgary. We now have two trailers, working our way towards a third trailer and have events all over Saskatchewan, Alberta and British Columbia. It has been a fabulous ride and we can't wait to see what the next ten years brings us! Of course, none of this would be possible without our many sponsors and partners and of course the general public who have been so generous in their donations. It is wonderful to see all the new names that appear on our trailers every year. We are looking forward to another successful year and we will keep you all updated as events occur all over Western Canada! And don't forget, drop us an email if you would like to help or leave a comment on our blog if you have suggestions or ideas to help this worthwhile cause!